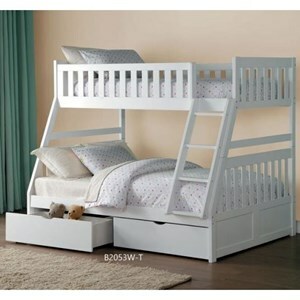 This transitional twin over twin bunk bed is perfect for a youth bedroom or a cabin. 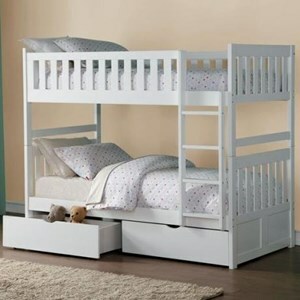 The bunkbed has a staircase for convenient access to the top bunk and four drawers for extra storage space. Trundle not included. 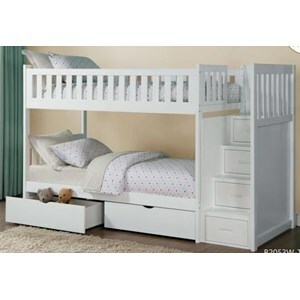 The Dublin Twin over Twin Bunk Bed with Staircase by Coaster at Beck's Furniture in the Sacramento, Rancho Cordova, Roseville, California area. Product availability may vary. Contact us for the most current availability on this product. 460362B4 T/T Bunk Bed 1 0" 0" 0"
460362B2 T/T Bunk Bed 1 0" 0" 0"
460362B3 T/T Bunk Bed 1 0" 0" 0"
460362B1 T/T Bunk Bed 1 0" 0" 0"
Browse other items in the Dublin collection from Beck's Furniture in the Sacramento, Rancho Cordova, Roseville, California area.